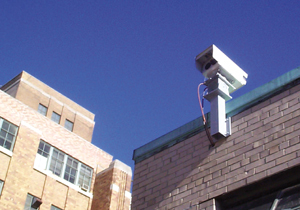 Free space optics systems like the Canobeam (pictured) work by beaming data between buildings at speeds up to 1.25 Gbps. Government agencies can use the technology to extend network bandwidth to locations where fiber can't reach. Canon has been working on free-space optics for 15 years, said Gordon Tubbs, assistant director of the company's broadcast and communications division. High-speed fiber-optic lines pass within one mile of an estimated 75 percent of the nation's commercial and government buildings. However, less than 10 percent of those buildings have fiber connections and, depending on whose research you look at, that figure could be as low as 3 percent. Much of that fiber went into the ground when the telecommunications industry was flying high in the 1990s. But when the bubble burst, industry hit the brakes and demand for fiber connections slowed. So today, instead of enjoying wide area network connections that operate at speeds of more than a gigabit per second, most organizations are settling for speeds in the megabit-per-second range. And as more bandwidth-intensive applications are adopted, including converged data, voice and video, business as usual isn't good enough. Laying fiber to complete the connection can be a costly, time-consuming process. So technology companies have come up with alternate ways to deliver fiber-caliber speeds for so-called "last-mile" connectivity, without the need for fiber cables. Companies such as Lake Success, N.Y.-based Canon U.S.A. Inc. and Redmond, Wash.-based Terabeam Corp. build free-space optics systems, which establish point-to-point connections over a beam of light. A third company, Chantilly, Va.-based GigaBeam Corp., has developed similar point-to-point technology, only it uses ultra high-frequency radio waves. According to experts, these solutions are a quick, easy way for government agencies and their network integrators to establish fiber-speed connections to and between government buildings. But they also agree that such technologies may find more acceptance as niche solutions than as long-term, last-mile substitutes for fiber. "If we look down the road five years, we'll be swimming in bandwidth," said Jeff Kagan, an independent telecommunications analyst in Atlanta. "But what do we do for the next few years?" When the World Trade Center buildings collapsed Sept. 11, 2001, the New York State Unified Court System lost a T1 connection to the Verizon central office in downtown Manhattan. Court buildings were without voice and data services. But a fiber link to one location remained up and running. The question became how to extend that connectivity to other court buildings. Hseng Guo, chief technical officer for the court system, said he did some quick research and made a call to Canon requesting a pair of the company's Canobeam free-space optics lasers. "We needed to find the quickest way to get those buildings running again," he said. Today the New York court system has deployed Canobeam technology throughout the state. "In many cases, doing fiber is cost-prohibitive," Guo said. "In Manhattan especially, there are landmark buildings to get around, and it can be hard to get the permits to dig up streets and lay fiber." Guo said it costs him about $40,000 to install a Canobeam connection. Running 1,000 feet of fiber could cost up to $100,000. [IMGCAP(2)]Free-space optics, such as Canobeam, isn't a new technology. According to Gordon Tubbs, assistant director of Canon's broadcast and communications division, the company has been working on it for 15 years. It wasn't until technology advances brought the cost down -- from $50,000 in 1999 to as little as $13,000 today -- that Canon's free-space optics products gained traction. Integrators, such as Lockheed Martin Corp., and government agencies, such as the Labor Department, use Canobeam technology, Tubbs said. In a free-space optics solution, data travels between two devices roughly the size of large shoeboxes. The devices are mounted on buildings, aimed at one another and connected to their respective wired networks, typically via 100Base-T or fiber cables. The point-to-point connections can be made between buildings, or between a building and a fiber point of presence. "It's ideal for campus connectivity at government agencies or military bases," said Jim Olson, vice president of carrier and federal sales at Terabeam, whose customers include the Homeland Security Department. The devices emit a narrow beam of light over which data travels. Today's technology can establish connections at distances of more than a mile, but the farther the light travels, the lower the transmission speed. According to Olson, Terabeam's Elliptica series can send data nearly 2.5 miles at speeds up to 155 Mbps. The typical T1 line runs at only 1.5 Mbps. In comparison, the Canobeam CT-130 is rated at up to 1.25 Gbps, but only at distances of roughly half a mile. Both companies offer different flavors of their free-space optics technology, to fit an agency's bandwidth and distance needs. As an alternative to free-space optics, GigaBeam has developed products that use ultrahigh radio frequencies -- in the 71- to 76-GHz and 81- to 86-GHz spectrums -- to establish connections of more than a mile. Last October, the Federal Communications Commission authorized commercial licensing rules for this high-frequency spectrum, paving the way for technologies such as GigaBeam's. Lou Slaughter, GigaBeam's chief executive officer, said the products will begin shipping in July and run at speeds up to 2.4 Gbps. "It's as fast as fiber, as reliable as fiber, but way inexpensive compared to fiber," Slaughter said. Pricing hasn't been determined. In addition, GigaBeam technology can be adapted to meet future bandwidth needs. "This technology can scale," said Frank Dzubeck, president of Communications Network Architects Inc., a Washington-based telecommunications analysis firm. "You don't just build something to do a gigabit. This can scale to 10 gigabits. At this spectrum, you can have higher and higher bandwidths." Beside its free-space optics product, Terabeam also sells a radio-based solution. Its Gigalink series uses millimeter wavelength technology and operates in the 60 GHz spectrum. It can run at up to 1 Gbps. Slaughter said GigaBeam's products would incorporate technology that ensures "five 9s" of availability, meaning the connection operates 99.999 percent of the time, even under adverse atmospheric conditions. But if there's one major hurdle that Canon, Terabeam and GigaBeam must overcome, it's the perception that wireless connections, even over powerful, narrow beams, are less reliable than fiber cables. In the New York court system, Hseng Guo said fiber is his agency's preferred means of network connectivity. Where that's not feasible, he will turn to free-space optics, despite atmospheric limitations. "One winter we had very heavy snow, and that degraded the signal," he said. In general, free-space optics can be affected by fog; radio frequency technology is susceptible to rain. Such conditions should factor into the decision to deploy either solution. According to Olson, Washington tends to be a good city for free-space optics. Analysts said both technologies are, in fact, extremely reliable, but acknowledged that they'll probably see adoption under special circumstances rather than as primary connections to a fiber backbone. "These technologies can serve as backup connections," Dzubeck said, "or as a temporary primary connection when networks need to be brought up and taken down quickly, like at a Super Bowl." Canon's Tubbs said customers have bought Canobeam technology to run alongside a T1 line, although in such situations, he said, the T1 line normally acts as the redundant connection, while the much faster Canobeam provides the primary connectivity. The most popular use of free-space optics and ultra high-frequency wireless solutions is likely to be building-to-building networking, especially on campuses and in urban locations where streets, rail lines, waterways and other impediments make it difficult to lay fiber between an organization's buildings. But analysts are quick to point out that fiber remains a viable option for agencies that have the time and resources to deploy it. Carriers and equipment providers have rallied around a "fiber to the premises" initiative to spur fiber adoption. In February, the District of Columbia announced it would build its own fiber-optic network to connect more than 300 sites to a high-speed backbone. The city chose networking equipment from San Jose, Calif.-based Cisco Systems Inc. for its optical services. "Our customers, the service providers, are running fiber as quickly as they can," said Scott Messenger, director of marketing and product management for Cisco's optical networking group. "In the short-term, it's going to be a challenge in densely populated areas where fiber is not cost effective ... but fiber is definitely the technology that most people are comfortable with." But until fiber reaches more customers, the alternatives will continue to gain ground, experts said.